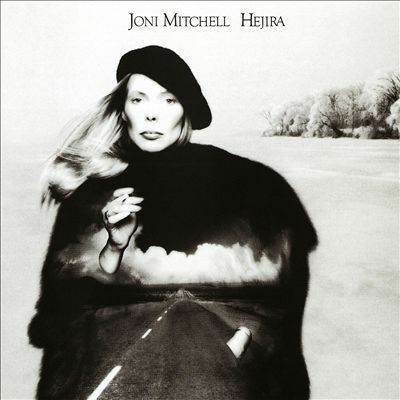 Joni Mitchell's Hejira is the last in an astonishingly long run of top-notch studio albums dating back to her debut. Some vestiges of her old style remain here; "Song for Sharon" utilizes the static, pithy vocal harmonies from Ladies of the Canyon's "Woodstock," "Refuge of the Roads" features woodwind touches reminiscent of those in "Barangrill" from For the Roses, and "Coyote" is a fast guitar-strummed number that has precedents as far back as Clouds' "Chelsea Morning." But by and large, this release is the most overtly jazz-oriented of her career up to this point -- hip and cool, but never smug or icy. "Blue Motel Room" in particular is a prototypic slow jazz-club combo number, appropriately smooth, smoky, and languorous. "Coyote," "Black Crow," and the title track are by contrast energetically restless fast-tempo selections. The rest of the songs here cleverly explore variants on mid- to slow-tempo approaches. None of these cuts are traditionally tuneful in the manner of Mitchell's older folk efforts; the effect here is one of subtle rolls and ridges on a green meadow rather than the outgoing beauty of a flower garden. Mitchell's verses, many concerned with character portraits, are among the most polished of her career; the most striking of these studies are that of the decrepit Delta crooner of "Furry Sings the Blues" and the ambivalent speaker of "Song to Sharon," who has difficulty choosing between commitment and freedom. Arrangements are sparse, yet surprisingly varied, the most striking of which is the kaleidoscopically pointillistic one used on "Amelia." Performances are excellent, with special kudos reserved for Jaco Pastorius' melodic bass playing on "Refuge of the Roads" and the title cut. This new reissue cut by Chris Bellman at Bernie Grundman Mastering and pressed at RTI is sonically superior to the original in every way. There’s far less if any compression (if any). Dynamics are far greater, imaging well-clarified and soundstaging far more expansive and deep. In every way the reissue beats the original’s sonics. It's a difficult cut too, because the sides are long. .. AAA mastering and RTI pressing these days is quite reasonable." - Michael Fremer, www.analogplanet.com, 10/11 Music, 10/11 Sound! This excellent album is a rewarding listen.